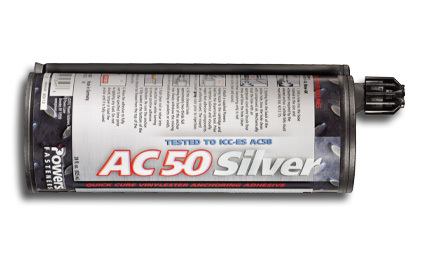 The AC50 Sliver is a two-component, adhesive anchoring system. The system includes injection adhesive in plastic cartridges, mixing nozzles, dispensing tools and hole cleaning equipment. The AC50 Sliver is designed for bonding threaded rod and reinforcing bar hardware into drilled holes in concrete base and solid masonry materials. The information and data contained within this documentation was current as of August 22, 2013.